Funded by the NIH, Dr. Jiang’s research aims to elucidate mechanisms of vascular remodeling that lead to vein graft failure, arterial restenosis and aortic aneurysm development. 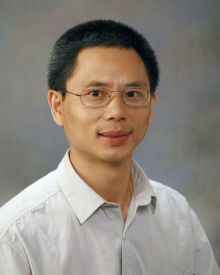 His group has employed various surgically-created laboratory models, Cre-loxP system-mediated conditional gene deletion, primary cell cultures, bone marrow transplantation and cutting edge imaging approaches to identify cellular effectors and molecular mediators that regulate the pathogenesis and geometric remodeling of the vessel wall under various clinically relevant conditions. His research group is working on multiple projects that focus on the TGF-b biology. Using SMC specific deletion of Tgfbr2 and Alk5, the research team has identified Alk5, but not Tgfbr2, as an essential element for maintaining homeostasis and structural integrity of the aorta. Efforts are underway to characterize the functional relationship of these receptors, elucidate the molecular mechanisms triggering the canonical and non-canonical TGF-β signaling pathways, and evaluate the role of TGF-β in regulating the development of aortic aneurysm and hyperplastic intimal growth in injured arteries and bypass vein grafts.